I’m not talking about the “pulse-pounding intensity” referred to by the cliché-addicted “critics” who make their living blurbing the latest action films. The intensity of The Passion of Joan of Arc is that of an artistically groundbreaking film about a woman undergoing one of the most severe crises of faith in human history. In exploring Joan’s fragmented, fraught subjectivity, Dreyer employed a style that is, remarkably, as comprehensible as it is radical. Indeed, as I suggested to my students, the film’s pre-eminent achievement is that it exists on two seemingly contradictory levels. Its story is entirely comprehensible, yet its style is extremely odd and arresting. 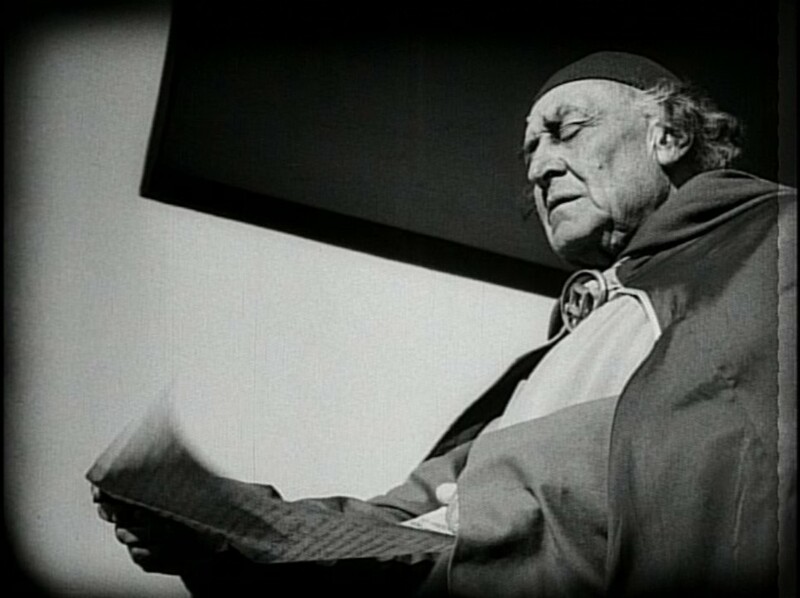 The real miracle here is not the conversation with the divine that Joan claimed to have, but the clarity with which Dreyer conveys his ideas using such a strong, strange style. 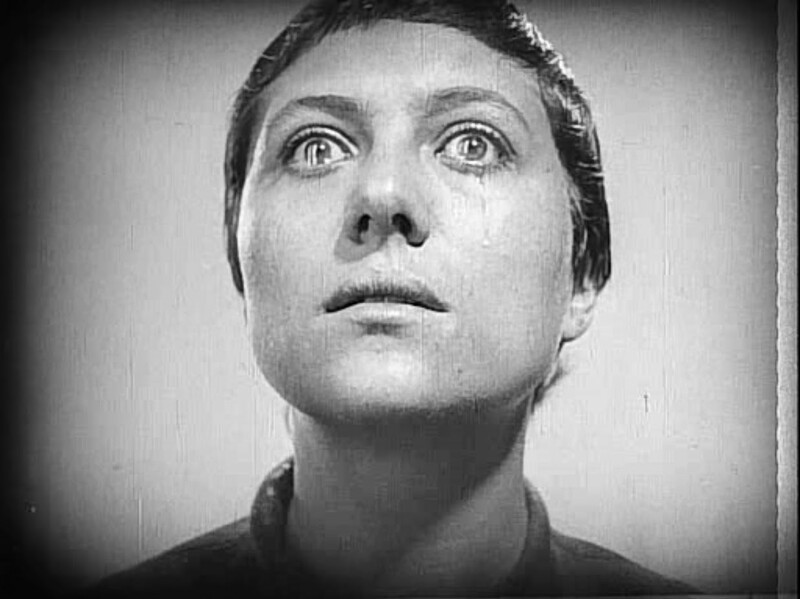 That the story of Joan of Arc is well known surely works in Dreyer’s favor — a condition that was even more relevant in 1928, when the film was released, as Joan had been canonized only eight years earlier. It’s not that her tale was the stuff of headlines, but it did have, perhaps, a little more currency than it does today. Few of my students, for instance, knew even the basics of Joan’s story, and I can’t say I ever thought to look into them until I saw this film for the first time. Even audiences unfamiliar with the story of Joan of Arc surely know that she was burned at the stake for heresy several hundred years ago. Viewers of The Passion of Joan of Arc know how the story will end, placing Dreyer at a certain advantage: He can present his story in an unstraightforward manner and still be fairly sure of audience comprehension. 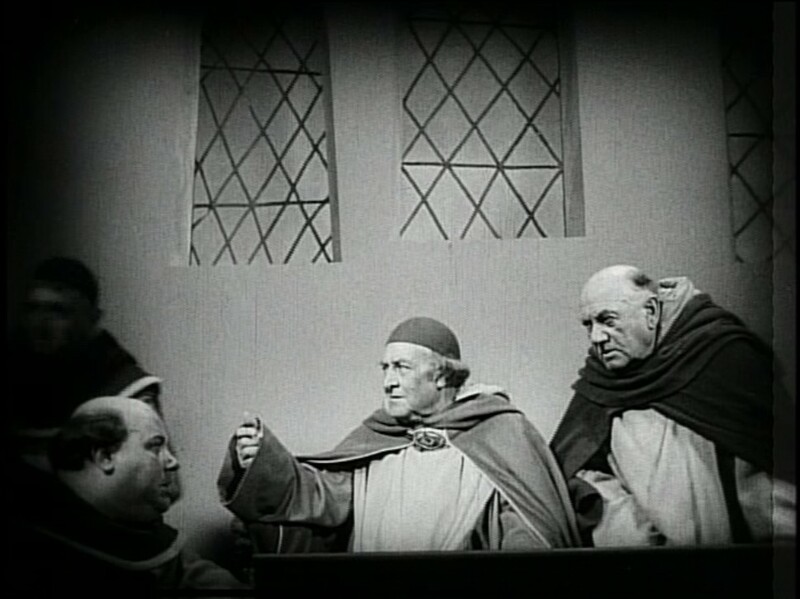 Still, one could make the case that Dreyer pushes his luck. The style of the film is unusually noticeable and potentially disorienting. Most potentially disruptive is the fact that the majority of the shots in the film are close-ups or medium close-ups — mostly of characters’ faces. Such compositions, by definition, exclude spatial context, so it’s unusually difficult to know where the film's events take place, a condition that can often result in confusion. Further, Dreyer mostly eschews — or deliberately undermines — such editing techniques as matches on action and eyeline matches, the purpose of which is to clarify spatial (and temporal) relationships between shots. In most scenes, one character will speak to another from within an isolated close-up that gives incomplete or misleading information about the physical location of the person on the other end of the conversation. Yet the scenes’ story information is inevitably comprehensible. Another stark choice of Dreyer’s was to shoot the film in a (huge, vastly expensive) set that presents an “impossible” space. Most of the interior and exterior walls in this film are featureless, making it difficult for the viewer to gauge depth and scale. The features of the nonfeatureless walls are often seemingly contradictory or askew. Observe the archway in the image above. It’s lit and/or painted in a way that makes it difficult or impossible to see whether it is inset into the wall. The two adjacent windows in the image below are similarly out of whack. They are of different sizes, heights and patterns, all features uncharacteristic of the architecture and design of the medieval European church in which most of the film’s story takes place. 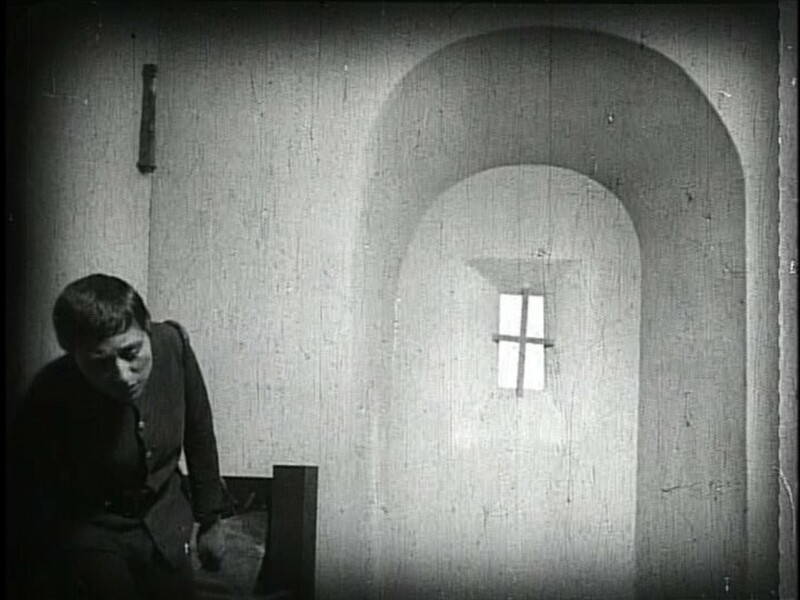 My favorite examples of spatial disorientation in The Passion of Joan of Arc, though, are the images that are composed in ways that nearly turn them into optical illusions. In both of the examples below, it’s impossible to identify with certainty the architectural features of the sets. 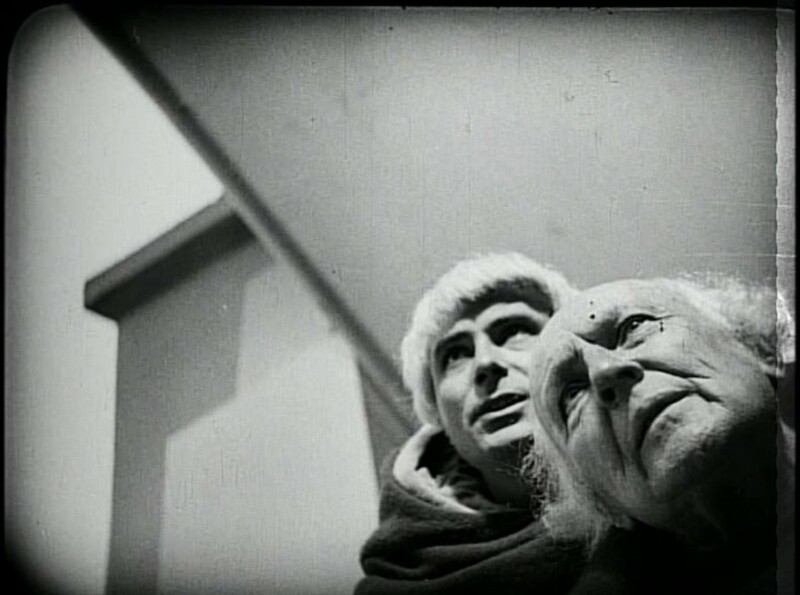 In the canted-angle shot of the two priests, what is the large, diagonally oriented slab behind them — a wall or an overhang? In the shot of the priest reading the proclamation, what is the oblique black form behind him, and where, exactly, is the man standing? Dreyer simply doesn’t give us enough information to answer these questions. These examples just scratch the surface of the film’s unusual and potentially forbidding style. 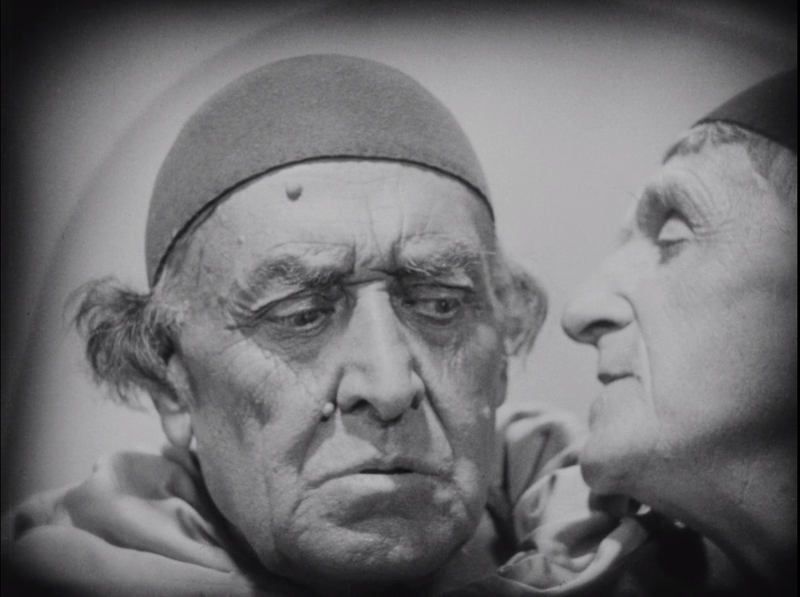 The film contains well over 1000 shots — an incredibly high figure for the late 1920s — and Dreyer deploys his style in nearly all of them in unconventional ways. The result, as scholar David Bordwell has argued, is a film that dispenses with standard depictions of space, time and causation to present a world that is out of sync with reality. Rather than abide by physical laws, the world of The Passion of Joan of Arc abides by the variable emotions and subjective experiences of its main character as she undergoes intense mental turmoil. The imperfectly rendered space and time of the film reflect Joan’s unsteady mental state: We experience the story as she experiences the story. Dreyer’s stylistic experimentation creates one of the most thorough — and intense — subjective experiences in all of cinema.